Anyone can be fit regardless of age, exercise history, fitness level, goals, available equipment, schedule availability, medical history, etc.). I will progress you as fast and safe as possible in order to reach your goals. NASM CPT certified. 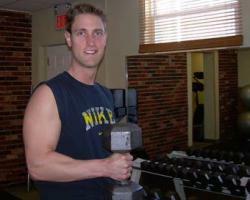 10 years full time personal training experiance. I always make the workout fun and interesting! I am very friendly and professional, you should never feel intimidated when working with me. Most of my clients either are or remain friends with me for years. My studio has been established for nine years and boasts a refined clientele and a clean work out facility.